COULD NOT CLARIFY WHAT THE WORD DEVOLVE MEANT!! In Case of the Removal of the President from Office, or of his Death, Resignation, or Inability to discharge the Powers and Duties of the said Office, the Same shall devolve on the Vice President, and the Congress may by Law provide for the Case of Removal, Death, Resignation or Inability, both of the President and Vice President, declaring what Officer shall then act as President, and such Officer shall act accordingly, until the Disability be removed, or a President shall be elected. (U.S. Constitution , Article II, Clause 6). Until the 25th or Rockefeller Amendment clarified Presidential succession, not one of the lawyers on the Supreme Court had ever attempted to clarify what devolve really meant. Was the Vice President just acting President until a new election? Was he authorized to sign bills or send men into combat? The highly-paid justices for life just didn't know . . . or didn't want to know! George Washington began his second term as President on March 4, 1793, in Philadelphia. George Washington's 2nd inaugural at Philadelphia, March 4, 1793. George Washington was administered the Presidential oath of office by Associate Justice of the Supreme Court William Cushing. The Constitution does not state who should administer the oath, but from that time onward, the oath was administered by the Chief Justice of the Supreme Court. Thus a precedent was established that the oath should be administered by the Chief Justice of the Supreme Court. By having the oath administered by a member of the Supreme it certified the legality of the election and that the President was indeed the lawfully elected ruler of the land. John Tyler was the first "Accidental President"
The story of the annexation of Texas to the Union is one of the most diabolically clever scams in the entire history of the world. The architect of the plan was British Prime Minister George Canning (cunning). President from March 4 to April 4, 1841. War of 1812 hero General William Henry Harrison was the Whig candidate for President in 1840. On the same ticket was a lecherous lawyer named John Tyler. Tyler spent the war fornicating with his female slaves on his vast plantation in Williamsburg, Virginia. Not until Kennedy and Johnson could 2 more dissimilar men be found on the same Presidential ballot. Acting President from to '41 to '45. Both men ran on the same ballot, and no opportunity was given to the voters to reject slavemaster John Tyler. Tyler was not in Dallas when he heard the "good news" of the death of the President. He was in Washington City in less than 24 hours, and that is where the Supreme Court is located. All the justices of the Supreme Court were available to Tyler if he wished to make his Presidency legitimate. He ignored them all . . . and those "guardians of the law" ignored him! Judge William Cranch—a President Jefferson appointee—agreed to administer the "Presidential Oath." Tyler was then sworn into the office of President before William Cranch, chief judge of the circuit court of the District of Columbia. He felt that the oath taken as Vice-President was sufficient, but in order to forestall any doubts that might arise he took this second oath. The installation took place in the parlor of the Brown's "Indian Queen" hotel (Chitwood, John Tyler: Champion of the Old South, p. 203). Millard Fillmore was the second "Accidental President"
The Constitution of 1787, written by lawyers, was deliberately very vague about the most important office in the land, namely the President of the United States. A cursory glance at history would have told them that the SUCCESSION is the most important issue of all. It was the succession crisis in England at the time of King Henry VIII that led to the overthrown of Papal power in that country. President from March '49 to July '50. General Zachary Taylor was a hero of the U.S.-Mexican War. He was sworn in by Chief Justice Roger B. Taney. As usual, the Texans were causing trouble, and they wanted their new western boundary to be the Pacific Ocean. That additional land grab by the Texas would have eliminated the states of New Mexico and California. Taylor was ready to send a military force to oppose them. That was just one of the main the reasons why he was assassinated by the British Secret Service. The next morning Fillmore informed Congress of the President's death. At noon before a joint session of both houses, with the cabinet present, Judge Cranch of the district court administered the presidential oath of office. (Rayback, Millard Fillmore, p. 241). Chief Justice Taney, and the rest of his highly-paid "justices for life," made sure to distance themselves from Fillmore's coup d'etat. Fillmore was in Washington City when he heard the "good news" that the President was dead. Judge William Cranch administered a "Presidential oath." Then Fillmore fired all the members of President Taylor's cabinet. Fillmore is mainly remembered as the signer of the infamous Fugitive Slave Law of 1850. The Fugitive Slave Law or Fugitive Slave Act was passed by Congress on September 18, 1850, as part of the Compromise of 1850 between Southern slave-holders and Northern Free-Soilers. That Act was signed into law by Fillmore, and it gave the slave-holders confidence that slavery would be legal in all the other states. The canny Taney and his Supreme Court refused to rule on it so it just postponed the Civil War by 11 years. His notorious usurpation began the era of the Underground Railroad, Harriet Tugman, and Harriet Beecher Stowe's Uncle Tom's Cabin. Andrew Johnson was the third "Accidental President"
President Lincoln was inaugurated as President for a second term just over month before his assassination. He Presidential Oath was administered by Chief Justice Salmon P. Chase. President Lincoln just before his assassination. Incredibly, Lincoln held an national election in the middle of the Civil War. He always believed in letting the people decide who should lead them. His Vice President, or "running mate" was an unknown named Andrew Johnson. His swearing-in was performed by Chief Justice Salmon P. Chase. Lincoln was sworn in by Chief Justice Salmon P. Chase, March 4, 1865. Vice President Andrew Johnson was staying at a boardinghouse in Washington City the night of the assassination. Johnson had a reputation as a DRUNK, but his drinking was just to dull his guilty conscience. "Acting President" from April '65 to March '69. Salmon P. Chase succeeded Taney as Chief Justice. Johnson was sworn in by Chief Justice Chase because he could not ignore the Supreme Court, and Judge Cranch was dead by then. Chief Justice Salmon P. Chase (1808-1873). 2 of the biggest crimes of usurper Johnson was hanging Mary Surratt for the murder of President Lincoln and allowing the British to maintain control of Canada. Every facet of law was ignored by Johnson and the U.S. Supreme Court. All of the accused in the assassination of President Lincoln were civilians, but Johnson and Chase allowed them to be tried before a Military Commission. That "kangaroo court" sentenced the wrong Mary, and 3 other men, to be hanged. The second disaster of Johnson's usurpation was the failure to enforce the Monroe Doctrine. President Lincoln's motto was "one war at a time." That meant that he was waiting for the Civil War to be over before he dealt with the British presence in Canada. His timely assassination by Johnson put an end to that. By the end of his" Accidency," Canada was already forcefully annexed to the British Empire. 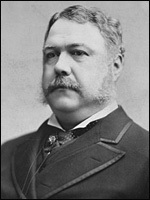 Chester A. Arthur was the fourth "Accidental President"
Chester A. Arthur was the fourth usurper or "Accidental President." Like President, James Garfield was born in a log cabin. He was also a general during the Civil War. He was inaugurated as President on March 4, 1881 and was sworn in by Chief Justice Morrison Waite. After less than 4 months in office, President Garfield e was shot by a British Secret Service agent named Charles Guiteau. For some strange reason, the British Secret Service decided to eliminate the President by shooting . . . instead of their normal method of poisoning. British Secret Service agent Charles Guiteau shot President Garfield on July 2, 1881. The President struggled heroically to survive, but finally his doctors killed him on Sept. 19, 1881. Vice President Chester A. Arthur was immediately sworn in by Chief Justice Waite. The assassination of President Garfield, and the usurpation of Chester A. Arthur, were severe blows to the nation politically. Chester A. Arthur was one of the most corrupt lawyers than ever lived and he was sent to meet his Maker at the young age of 57. Teddy Roosevelt was the fifth "Accidental President"
Teddy Roosevelt was the fifth usurper of "Accidental President." Civil War hero William McKinley was inaugurated for his 1st term as President on March 4, 1897. He was sworn in by Chief Justice Melville Fuller. His Vice President was named Garret Augustus Hobart. President McKinley was a patriotic President and thus incurred the enmity of the British from the very beginning of his term. 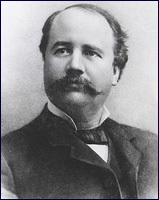 However, his Vice President, Garret Hobart was also patriotic, and his replacement of McKinley would not change the political situation in the country. The Spanish-American war of 1898 was started to make a war hero of Teddy Roosevelt and place him in a position to seize the Presidency. "Plastic" man Teddy Roosevelt became a "war hero" during the Spanish-American War. He supposedly led a charge up San Juan Hill in 1898. He did receive a barrage of publicity, and that was enough for him to be appointed "Republican" governor of New York. the charge up San Juan Hill in 1898. Absolutely nobody expected "plastic" man Teddy Roosevelt to replace Garret Hobart as Vice President. The impossible did happen when Hobart died suddenly of poisoning. Amazingly, Vice President Hobart died suddenly and Teddy Roosevelt became McKinley's "running mate." The stage was set for McKinley's assassination and replacement with Roosevelt. 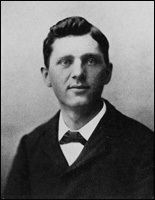 The assassination of President McKinley was carried out by a British Secret Service agent named Leon Czolgosz. Roosevelt quickly grabbed a federal judge named John Havel to perform a "swearing-in" ceremony. Roosevelt didn't even bother to repeat the performance for the Supreme Court when he returned to Washington City. Roosevelt quickly grabbed a federal judge named John Hazel for his oath as "Acting President." Roosevelt didn't even bother to legitimize his illegal power grab when he returned to Washington City as "Acting President." No judge of the Supreme Court even bothered to meet him for another swearing-in ceremony. Calvin Coolidge was the sixth "Accidental President"
Calvin Coolidge was the sixth usurper or "Accidental President." Warren G. Harding was inaugurated as the 29th President of of the United States on March 4, 1921. The Presidential oath of office was administered by Chief Justice Edward White. The Harding administration was rocked by scandals, and the President was assassinated in San Francisco, on August 2, 1923. Coolidge received a telegram from Attorney General Dougherty urging him to take the oath of office immediately. He went across to the general store and telephoned Secretary of State Hughes, who informed him that the oath could be administered by a notary. Coolidge told Hughes that his father was a notary, and the secretary replied, "Fine." Coolidge returned home, and in the downstairs sitting room John Coolidge, using the family Bible, swore his son in as president. The time was 2:47 A.M.( Sobel, Coolidge: An American Enigma, p. 232). That secretary of state Hughes would later become Chief Justice of the Supreme Court from 1930 to 1941. The Presidential oath of office was administered by Calvin's father, a notary public, in the family home in Vermont. A future Supreme Court Chief Justice named Charles Evans Hughes told Calvin that a notary would be fine. Evans already knew that the Vice Presidency was a SCAM created by lawyers, and the oath was meaningless. Calvin was sworn in by his father, and witnessed by Mrs Coolidge, Porter H. Dale, and Leonard L. Lane. Most states have a minimum age of 18 to be a notary. The only other qualifications is the ability to read and write English and have no criminal record. A notary who knows the Bible knows more about real law than any Harvard "educated" lawyer. Calvin's administration set the stage for the "Roaring Twenties" and the subsequent Stock Market crash of 1929. Harry Truman as the seventh "Accidental President"
Harry Truman was the seventh "Accidental President." Truman's "Accidental Presidency" began just as WWII was ending and the world was about to enter the atomic age. President Roosevelt drank the poison cup at 12:40 PM, and by 3.35 PM, April 12, 1945, he was pronounced dead. So rapidly did the funeral take place that by 11 AM, April 15, the President was laid to rest at the Roosevelt estate in Hyde Park, New York. No more that 70 hours elapsed between the assassination and the burial of the President. President Roosevelt's Vice President or running mate was Harry Truman was Missouri. Amazingly, Harry Truman began to receive Secret Service protection about a month before the assassination of President Roosevelt. Harry Truman began receiving Secret Service protection about a month before the assassination of President Roosevelt. Truman was sworn in by Chief Justice Harlan Stone, but Stone could not tell him if he was the legal President of the country. That was not defined until the passage of the 25th Amendment in 1967. Some of the most momentous events of the latter days happened during the usurpation of Harry Truman. The atomic bombing of Japanese happened in August 1945. The Edomite state of Israel was created in May 1948 and NATO was created in April 1949. In 1950, Harry Truman bypassed Congress and declared war on North Korea. That war costs the lives of millions of people and could turn hot again at any time. Had President Roosevelt lived and finished out his term, the Cold War would never have started, and no atomic bombs would have been used on Japan. Lyndon Johnson was the eighth "Accidental President"
Lyndon Johnson is the last in the doleful series of " Accidential Presidents." Johnson was very familiar with the method used by John Tyler to seize power after his boss was assassinated. "Acting President" from Nov. '63 to Jan. '69. The timing of the assassination was critical for the plotters. Everything went according to plan and the President was pronounced dead at 1.00 p.m.
Federal Judge Sarah T. Hughes administered a "presidential oath" to Lyndon Johnson. On the right can be seen the sinister Jack Valenti, who tried desperately to ban the 1991 movie JFK by Oliver Stone. hands on a Roman missal. When a greatly disappointed Johnson arrived back in Washington City, Chief Justice Earl Warren never bothered to administer another oath or reassure him that was the legitimate President. That was because he didn't know himself. In the 122 years that had elapsed since the assassination of President Harrison, the court never took and interest in Presidential succession. All political candidates for the White House knew that a Nelson Rockefeller Vice Presidency meant a death sentence for them. That was why the 25th or Rockefeller Amendment was introduced in 1965. The passage of the Amendment also made the life of the President more precarious because it states clearly for the first time that the Vice President become President on the disability or death of the President. Remember, Remember, the 22nd of November!! To turn Washington City into radioactive rubble and cement. To fire a "Soviet" thermonuclear missile at the Rotunda. 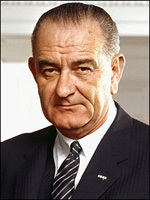 Lyndon Johnson knew that the United States capital would be gone in a jiffy. And ruling from Austin under the the Lone Star flag was his treasonous scam. And Clint Hill immediately joined her in the back seat. And Clint Hill fired the third shot into the President's head. And "Oswald" was taken out of the Texas Theater alive. Who fired a pistol at "Oswald's" spleen. So they silenced him until Judgment Day. And saved the Union from wicked women and men!! The only way to make America Great Again is to abolish the position of Vice President . . . and send ALL the lawyers to Texas!! The word Vice, as in Vice President, means a substitute for the President. It is the same word as ANTI in Antichrist, meaning one who takes the place of the real Pope. An Anti Pope is a substitute or usurper and so is a Vice President. Vice also means immoral or wicked behavior. The vice squad goes after prostitutes. Ackerman, Kenneth D. Dark Horse. The Surprise Election and Political Murder of President James A. Garfield. Carol & Grak Publishers, New York, 2003. Chitwood, Oliver Perry. John Tyler. Champion of the Old South. Russell & Russell Inc., New York, 1939. Crapol, Edward P. John Tyler: the Accidential President. University of North Carolina Press, Chapel Hill, 2006. Morris, Edmund. Theadore Rex. Randon House, New York, 2001. Niven, John. John C. Calhoun and the Price of Union. Louisiana State University Press, Baton Rouge, 1988. Rayback, robert J. Millar Fillmore: Biography of a President. American Political Biography Press, Newtown, CT., 1959. Sobel, Robert. Coolidge: An American Enigma. Regnery Publishers Inc., Washington City, 1998.